I tend to get obsessed with one kind of food, over and over. 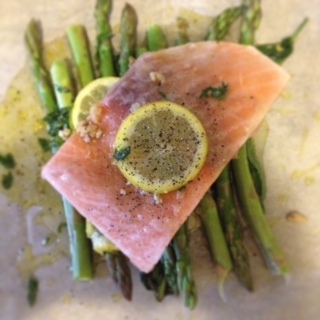 Right now, I’m obsessed with this combination of salmon, asparagus, lemon and tarragon. This is before I cooked the whole thing together. I took a photo of it (I’m not usually one to photograph food) because it looked so pretty and springy. I made a few mistakes in actually cooking this, however. 1) too long. I was impatient and used the filet frozen (which also lead to mistake #2) so I cooked the asparagus too long. 2) Too much liquid. When I cook, I don’t measure, I just throw things together. I had garlic, olive oil, tarragon, salt, peper, and lemon zest but it looked like i needed more liquid so i added in some lemon juice as well. Too much liquid. When I get a hang of this, I’l try to share a recipe. How smart is this? A woman in japan uses balloons to create easy, edible, chocolate bowls! I wish I had an occasion to use these! I am (honestly) going to try to update this thing daily…or mostly daily…although probably not on the weekends. At this point, there are so many blogs out there, I often wonder what’s the point. I like to cook, although I am not good at it. And I almost never have the items on hand to properly follow a true recipe so I often improvise. Would people like to read about that? Aren’t there enough food blogs in the world? I’m pretty crafty. I like solving problems. Maybe you have an idea and want to figure out how to do it? Aside from making stuff, I have a full time job in a gallery/studio where I work with people with disabilities. I also collect art (within a budget) (a pretty strict budget). Would you be interested in seeing what’s hanging on peoples walls and read about the artists and galleries from where the art came? I would really like to hear what you would like to see or read! 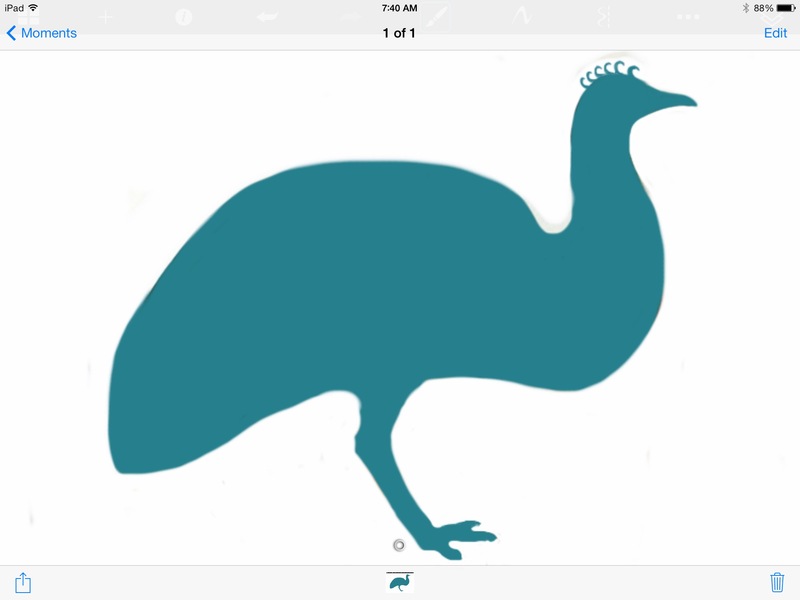 When I started to design the emu, my main concern was that people wouldn’t confuse it for an ostrich. Most of the “e” animals I was considering could easily be confused with another, more well-known animal. Eels could be snakes, Eagles or Egrets could be hawks, Echidnas could be aarvarks. There will stiil probably be a lot of people who wonder why there is an Ostrich strapped to their street’s lampost but to me I don’t know if i could make this more emu-y. Since I knew i was primarily working in profile, it was important for me to get that right first. I drew the outline on an ipad, erasing and adding and erasing and adding until I had the shape I wanted. I looked at photos of emus and asked myself “What do I like about this picture” and “what features make this an emu to me?”. For me, it came down to two things. There is a heaviness to the shape of an emus tail and its chest. I was still thinking in terms of art nouveau shapes so I tried to incorporate that into the general outline of the emu as well. After I decided on the emu, I started researching. Aside from a few meetings at a bird farm or two (we had ducks for a bit when I was a kid) I didn’t really know much about the emu. It turns out that their eggs are STUNNING. 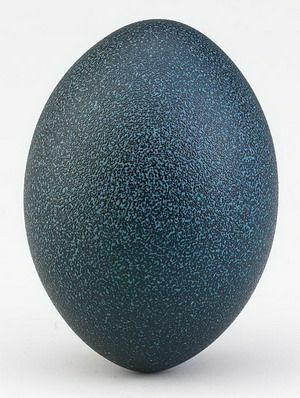 I was researching art nouveau examples of the emu and found a number of carvings that people made from their eggs. And can you blame them? I mean, look at this color! 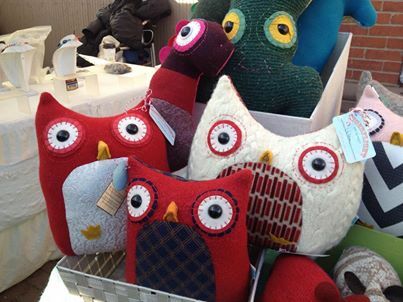 I’m mostly doing this as a test post, because i want to learn how to use this blog properly, so in the mean time, please to be looking at some owls I made especially for valentines day. They sure are red, aren’t they?